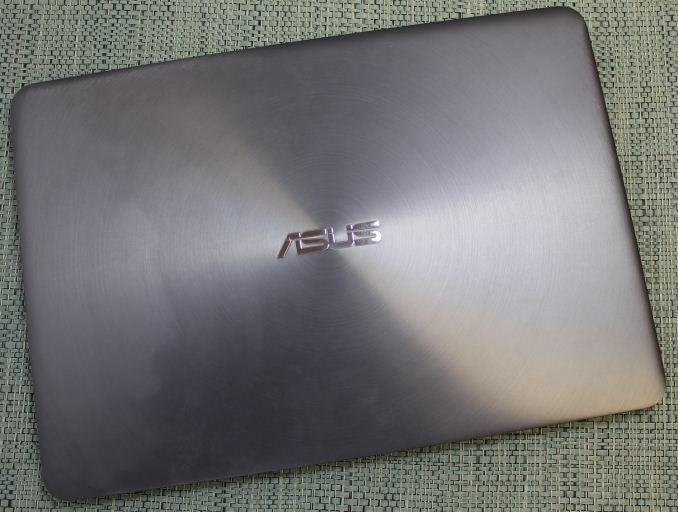 People who have seen or used any of the ASUS Zenbooks in the past will be familiar with the overall theme of the design, but the UX305 certainly sits apart from the rest of the lineup. It keeps the beautiful all-aluminum chassis, and the concentric-circles surrounding the ASUS logo on the lid. What sets the UX305 apart is how incredibly thin and light it is. At just 12.3 mm thick, and 1.2 kg in mass, the UX305 just wants to be taken with you. It has a very premium feel with the cool sensation of the aluminum which really makes you forget how little this laptop costs. ASUS has paid a lot of attention to detail on some aspects of the UX305. One that struck me instantly was opening the lid, which is something many devices do not get right. The UX305 has a very light touch to the hinge, allowing you to open it with just one finger despite the device’s low mass. Of course, the optional touch model will need to have more tension in the hinge, so hopefully they pay as much attention to detail with it as they do the non-touch model. The display will open to 128°, which is a reasonable amount for a traditional notebook computer, but what is strange is the reason for the limited angle on the UX305. 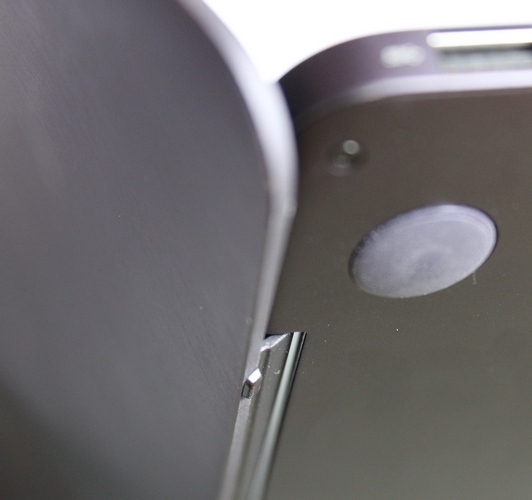 Unlike most devices, the UX305 has a rear hinge which is not attached at the bottom of the display. The hinge attachment on the display is shifted slightly upwards towards the top of the display. This means that when the display is opened, it shifts behind the laptop, and then under it, raising the back of the laptop slightly as it moves from resting on four rubber feet, to the two front feet and the bottom of the display. The display will eventually stop at the maximum opening with the rear of the laptop slightly raised. This is not the first device I have seen that does this, but it is far from ideal. The laptop has four rubber feet with plenty of grip, but the lid design means that the rear feet are no longer touching the surface. ASUS has prevented the aluminum edge of the display from being the contact point by adding to small plastic nubs on the back of the panel which end up being the feet when the laptop is open. This means that when I am using the UX305 on a soft surface like a wooden table, it can dig in a bit, and on a hard surface it will be less stable than when the four rubber feet are holding it up. To be honest it seems to serve no purpose at all. If it was for increased cooling, ASUS would be better served with a slightly thicker foot. It is certainly not for ergonomics. Moving on, once the display is open, you can see the island keyboard which is surrounded by the aluminum keyboard deck. The edge of the wrist rest is slightly beveled, which helps a lot from the sharp edges of the aluminum biting into your wrists as has been known to happen on some Zenbooks. While not quite as comfortable as one of the soft touch keyboard decks, there has to be something said about the feel of the cool aluminum when typing. It all feels very premium. 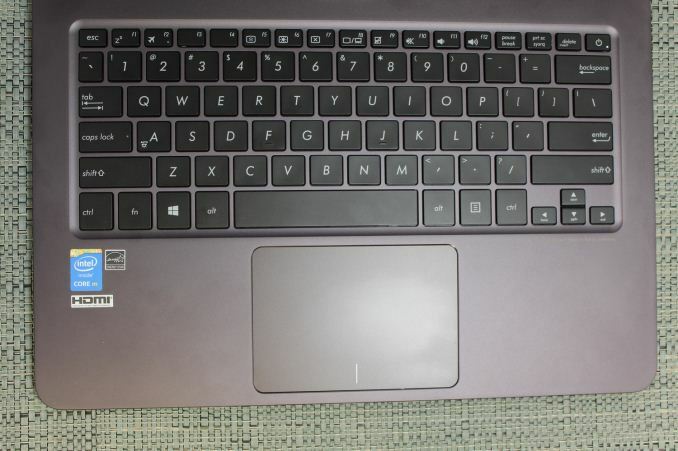 The keyboard is good for an Ultrabook, and I could type comfortably on it. Key travel according to ASUS is 1.5 mm. The keyboard layout is very standard, and the only thing that I dislike about the keyboard is that the power button is located on the top right corner above the backspace, and beside delete. Accidentally hitting it will power the device off of course, so it is not ideal. I did not have this happen to me during my time with the ASUS, and this is a common design on the Zenbook series. I think ASUS should move it, but they seem to like it there. Really the only missing thing on the keyboard is backlighting. Premium devices generally have this, so it is confusing that the ASUS does not until you think about the price. The ASUS feels very premium, so in your mind it should have backlighting, but then you have to remember that this is a lower cost entry, which keeps higher cost items like 8 GB of memory and a 256 GB SSD, so to hit the price point they did some sacrifices were made, and backlighting was one of them. The trackpad is quite large, and easy to use. It is 105 mm x 73 mm (4.13” x 2.87”) and there were no issues with usability. Tapping was never an issue, and two-finger scrolling worked well. The surface is very smooth and easy to glide over. The driver for the touchpad is provided by ASUS, and it seems like they are trying to move away from some of the poor touchpad experiences that have bitten them in the past. There is of course plenty of settings for various gestures to be enabled or disabled, and the left/right click can be reversed. My experience with the UX305 was that it was not the best touchpad I have ever used, but it is close. The drivers combined with the large surface area made the UX305 very easy to use. The UX305 has a full complement of ports on the side, with two USB 3.0 ports on the left along with a SD card reader, and a third USB 3.0 port on the right along with the power connector, headset jack, and micro-HDMI port. There is of course no room for an Ethernet port on such a slim device, but ASUS is nice enough to include a USB 3.0 Ethernet adapter in the box. For those that need it, this is a nice bonus. The speakers are downward firing through two grilles on the bottom of the device. Each speaker is 25 mm x 9 mm x 3 mm (meaning they are not round) and are set in a 1.7 cubic centimeter housing. ASUS has even gone to the trouble of ensuring the speaker wire length is equal on both sides. We will see later how well they perform. The design of the UX305 continues in the tradition of the Zenbook, and is really a beautiful machine to look at, pick up, and use. The design is not perfect, mostly due to the display being used to elevate the device when open, but this is a relatively small thing when you consider the premium materials used to construct this very thin, and very portable device. When you consider the price point, ASUS has done a fantastic job overall.